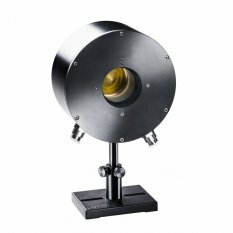 The 15K-W-BB-45 is a water cooled thermal power/energy laser measurement sensor for very high powers with a 45mm aperture. It can measure power from 100W to 15,000W. It has a deflecting cone and annular absorber that withstands high power densities to 10kW/cm². It covers the spectral range from 0.8 – 2 and 10.6µm. The sensor comes with a standard 5 meter cable for connecting to a meter or PC interface.